Not only the Armée de 'l Air and the Aeronavale opened their gates for one day during the same weekend, but also the Armée de Terre. The gates from Base école Général Lejay at Le Luc were opened for two days, on Saturday 4 and Sunday 5 June. Le Luc is located in the Provence-Alpes-Côtes-d'Azur in the South of France, between Toulon and Nice. It is the home base of The École d ‘Application de l'Aviation Légère de L'Armée de Terre (EAALAT) and a French-German unit, the École Franco-Allemande Tigre (EFA). The Germans call it the Deutsch Französische Heeresfliegerausbildungszentrum TIGER (D/F HflgAusbZ Tiger). The first Tigre's were recently delivered to this unit. Two Tigre's were parked on the static (A French and a German example) while another French example flew a display on both days. It was a small show, but absolutely worth to visit! The photographs on this page are made on the Saturday and the Sunday. 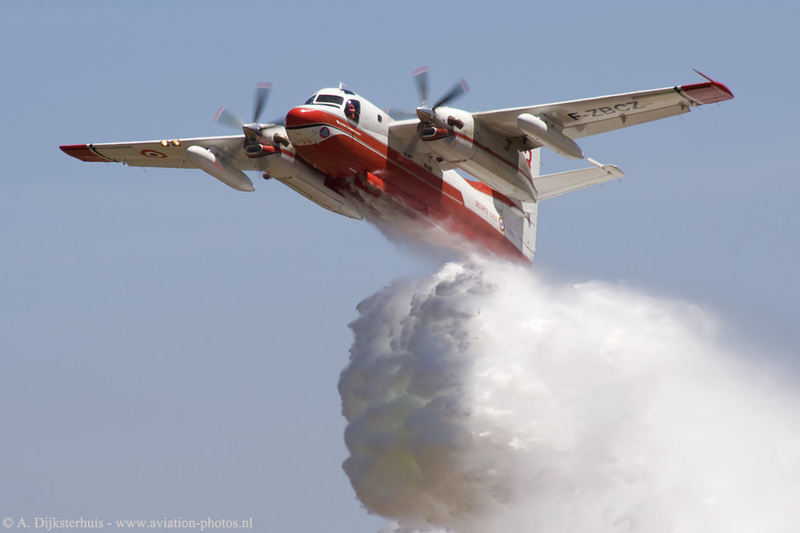 Fire fighting aircraft, as well as helicopters, participated in the air show with several flyby's and of course they displayed a water drop. 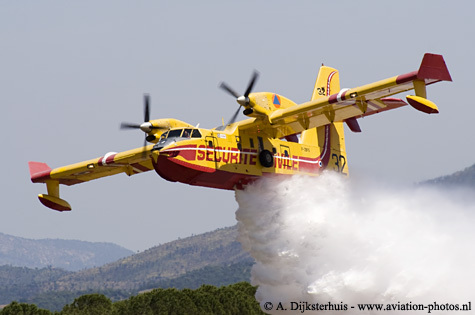 One of the two Canadair CL-415's at Le Luc on the Sunday, the F-ZBFS with code 32, is seen here in action. The CL-415 features a four-compartment, four-door water tank system and it can take only 12 seconds to scoop up this 6137-litre water load. 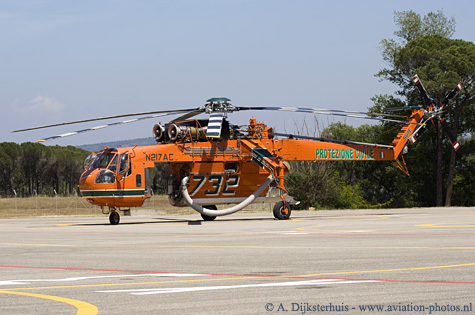 Besides the two Bell 205A1's there was also another fire fighting helicopter; the Erickson S-64 Skycrane helitanker. Six of these helicopters are operated by the Italian Protezione civile. One of them, with serial N217AC and code 732, came to Le Luc. Two Firecats Turbo Tracker Firecats (converted Grumman S2F Tracker aircraft) showed up at Le Luc. One of them, the F-ZBCZ/23, is seen here while it starts to climb after the release of it's water load. 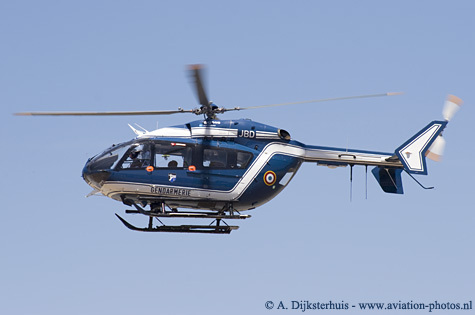 The Gendarmerie ordered eight EC 145 helicopters to replace the Alouette III helicopters. The EC 145 is in use for mountain rescue operations - in particular by the PGHM (Gendarmerie High-Altitude Mountain Rescue Unit) and by the GIGN (Gendarmerie Rapid Intervention Squad). The EC 145's has an especially spacious cabin that is configurable in several layouts, and carries up to 10 persons (9 passengers and a pilot). One of the eight examples, the 9019/JBD, is seen here during the demo on the Sunday. Another EC 145 at Le Luc. The Sécurité Civile ordered a fleet of 32 EC 145 twin-engine helicopters. 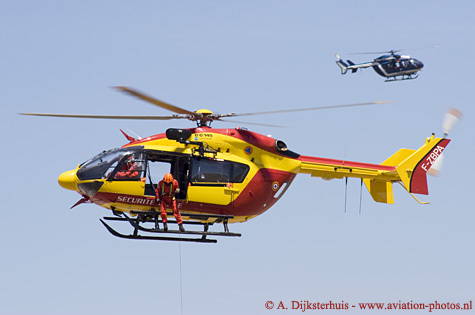 They received the first example in April 2002 and on 19 May 2005, the final EC 145 was delivered. One of them, the F-ZBPA, is seen here during a demonstration on the Sunday. The Sécurité Civile performs emergency missions (mountain and high-mountain rescues), sea rescues, fire-fighting missions, patrol operations, and emergency medical transport. Definitely one of the highlights of the show! Besides of a French and a German Tigre on static, this French Tigre, 2001/ATA, flew a nice display. 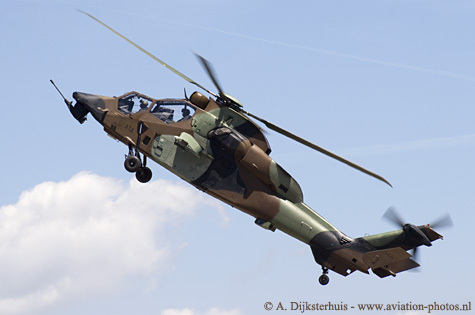 The Tigre is an air-to-air combat and fire support medium-weight helicopter fitted with 2 MTR 390 engines and are recently delivered. Another Eurocopter product at Le Luc. 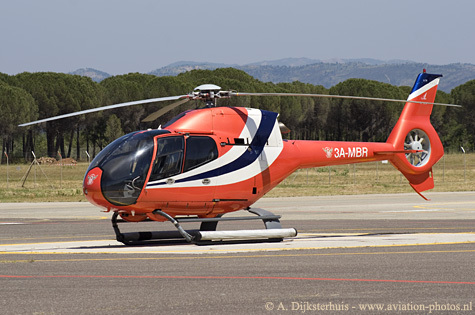 An EC 120B Colibri, 3A-MBR, belongs to Heli Air Monaco. The EC 120B is a single engine-helicopter, powered by a Turbomeca Arrius 2F turbine engine. This Colibri participated in the flying display while it was racing against a car and a couple of motorcycles. 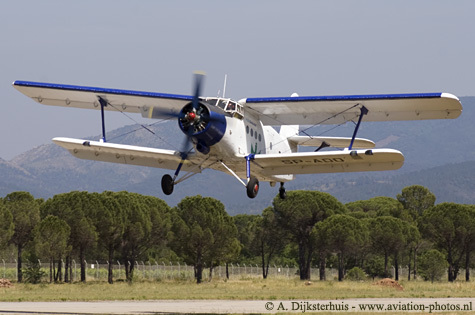 The world's biggest biplane, the Antonov AN-2T, participated in the flying display as well. This example, with serial SP-AOO, is seen here in take off. The first Antonov An-2 made it's maiden flight in August 1947. After almost 50 years, the Antonov An-2 is still an often seen aircraft in the airshow-circuit. 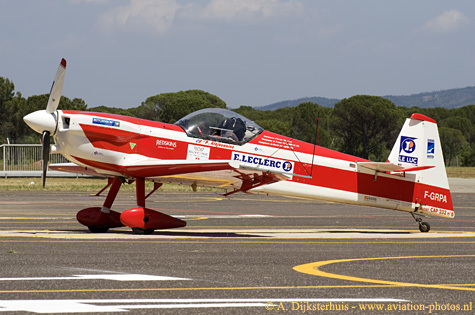 One of the aerobatical demonstrations at Le Luc was flown by a well known French female pilot; Pascale Alajouanine. She flies the Mudry CAP-232 with serial F-GRPA (and construction number 6), that was designed by Auguste Mudry. The maiden flight of the CAP-232 was in April 1996. In 1997, CAP Aviation acquired the rights from Mudry Aviation and restarted the production of this light aerobatic aircraft.